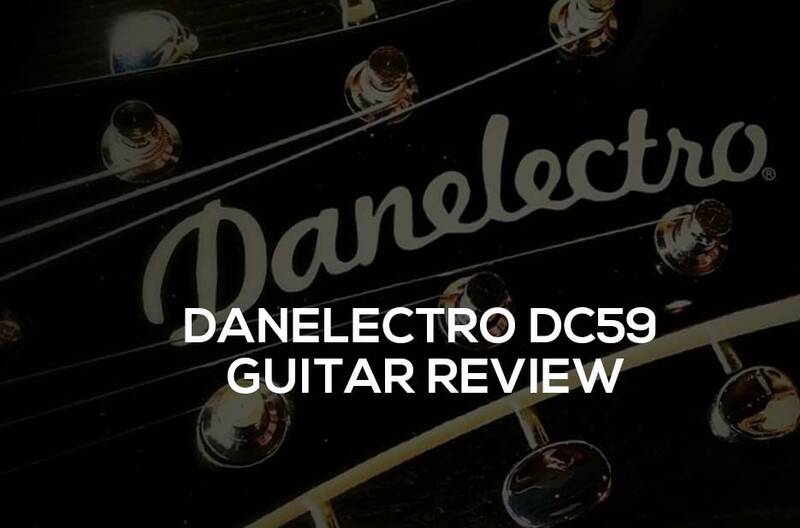 The Danelectro DC59 is a stylish guitar with a retro aesthetic that really stands out among most of the other monochrome or fairly standard models that most players tend to gravitate towards. This is just a bit left of the norm, giving you just a bit of edge while up on a stage. The looks alone are a major selling point of course, but there’s plenty under the hood as well. If you’ve been looking for a guitar that’s a little bit unique but still sounds good enough to play on stage or record with, this just might be for you. First of all, you’re not going to have to pay too much for this instrument. Purchased new, and it can often be found on sale for even less. The quality of parts for the price is plenty impressive as well. Danelectro’s instruments are made in Korean factories, and they’re very strict about making sure every single aspect of each guitar is up to snuff as it’s assembled. The finish of the body is known as “limo black” and it’s quite rich overall. It’s offset wonderfully by the white masonite scratchplate, which is truly unique in the way it weaves in and around the right of the body. The tuners are Danelectro branded, and they’re arranged in a stylish “3 on the left, 3 of the right” pattern that will make players of Gibson guitars feel right at home. They also happen to stay in tune quite well! The body shape itself is something of an odd Les Paul and Stratocaster hybrid, with just enough of a different double cutaway style to stand firmly on its own. There’s no other guitar that looks like this. It sounds great too of course. The single coil lipstick style pickups aren’t going to be suited for the likes of metal or hard rock, but if you’re into styles such as punk, alternative, pop, jazz, ska, and so on, you’ll be able to make this guitar really sing. You’re also given 21 frets, which are set nicely on a rosewood neck. The action is quite fast, so you’re really going to love having this in your hands if you’re the type to play quick flourishing melodies and leads. Finally, each pickup can be controlled with stacked volume and tone knobs, and you can toggle between them with a three-way switch. A lot of the time, it seems as if electric guitars are mostly marketed towards metal and hard rock players. You’ll be able to play gigs, create professional-sounding recordings, and even just sit around playing this casually without any problems. Overall, the Danelectro DC59 is a fantastic instrument that any lover of electric guitars should give a try. This is a fun instrument with a gorgeous and unique design that gives you a legitimate option if that's not the camp you fall in line with. The sound is top notch, the price is more than fair, and it's easy to play.